Attended my high school's prom last month and met all my good old friends. The theme was Hollywood. Like everyone else I was also in a dilemma about choosing dresses. Searched high and low for the perfect evening gown, and fell in love with this dress the minute I laid my eyes on it. Adore its simple yet elegant and timeless design. Not to forget, the hue of this dress is a light champagne gold which is incredibly beautiful. Instead of having the usual earrings, I thought this Lovisa's ear cuff that I acquired quite a while ago would suit the dress even better. The dress is from Magazine Boutique in Bangsar. If you're searching for a gown and you're in KL, Bangsar is definitely a place you should visit! I also purchased another dress from Miss Selfridge which I then wore it to my college's Year End Ball. 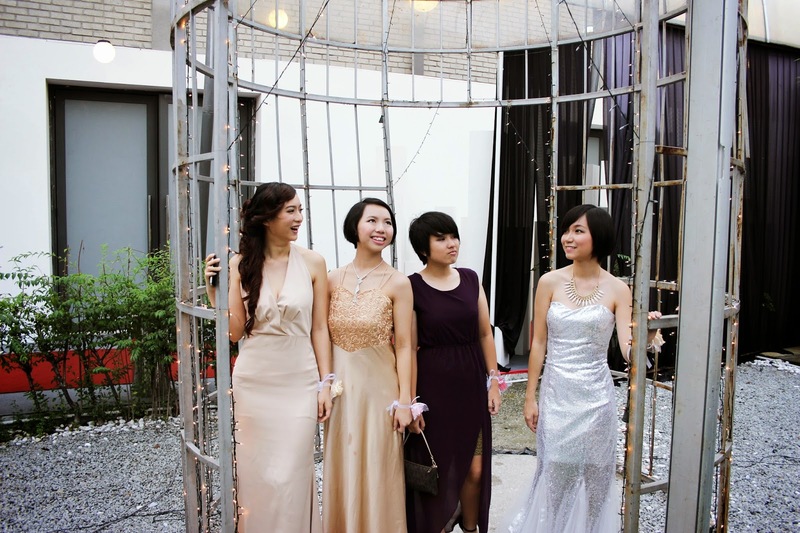 Gladly, I had some photos taken at my high school's prom by Jia Ying and Pei Ying so that I could blog about it. I came to the venue with three of my best friends, Jia Chi, Eunice and An Shi. Thanks for their company throughout the night. It's great to have your best friends as prom dates to break the tradition and to mark the memorable night. Hi Thongjean.You'd take really good pictures!Lurve them.May I know what lens you've been using all this while?